A number of conditions can cause white, itchy marks under the skin of your hands. While it may be embarrassing, it is usually treatable, no matter what caused it. In some cases, a moisturizer will help to treat your condition. Sometimes, you may need professional medical aid to cure your hands. It’s imperative to have your skin properly diagnosed prior to beginning any treatment regimens. The white patches under the skin on your hands may appear as small flakes or they can appear as long streaks. The diameter of the white marks may appear as small as a pea or as wide as a dollar bill. The size will vary depending upon the cause and severity of the skin condition, according to the American Academy of Dermatology. Depending upon the cause, the white marks may itch and cause discomfort. It is possible to develop white patches of skin on your hands that do not itch or cause any discomfort. The skin may also flake off when scratched. This will depend upon whether the condition affects only the surface layer of your skin or whether it lies within deeper skin tissues. 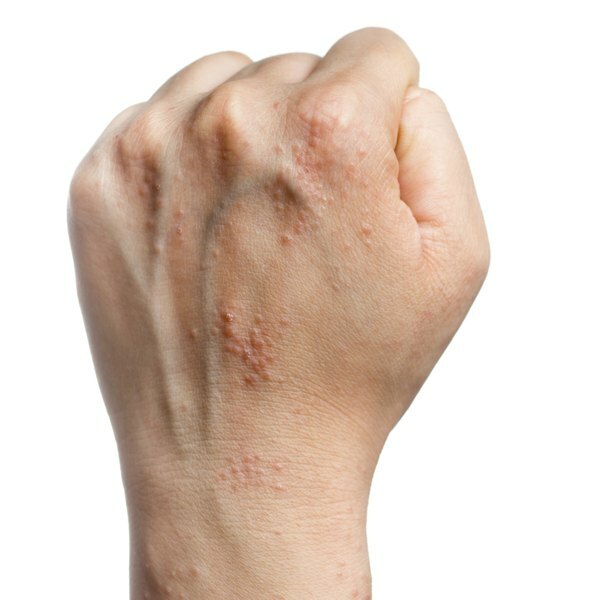 Fungal infections, such as ringworm and yeast infections, can affect your hands. Ringworm lies below the surface layer of skin, so it is much deeper than a yeast infection. A yeast infection typically affects the top layer of skin, but if scratched, it may enter deeper layers of skin tissue. Ringworm can affect any part of your hands or body. When yeast infections are found on hands, the yeast generally develops in folds or creases of skin, such as between your fingers. Psoriasis can also develop deep under your skin while affecting superficial layers of skin at the same time. Vitiligo is another condition that can cause white marks under your skin, which can form on any part of your body, but is commonly found on hands; however, this condition does not cause itching. You can contract ringworm, according to FamilyDoctor.org. Ringworm is a form of athlete’s foot, which is a fungal infection. The most common ways to spread fungal infections is by coming into contact with another infected person. You also can contract the fungus from moist, public areas, such as a public shower or locker room. Yeast infections are not generally contagious, according to MedlinePlus, however, you may contract a yeast infection if you have a compromised immune system. Psoriasis and vitiligo are not contagious, but both are hereditary. Wearing shower shoes while in public swimming areas, shower rooms and locker rooms can help to prevent contracting a fungal infection. Keeping your hands dry at all times can help to prevent developing a yeast infection between the folds of skin, especially if your occupation requires regular or constant hand washing. Moisturizing your skin can help to treat and prevent psoriasis, according to FamilyDoctor.org. If you begin to develop white patches of skin on your hands, or any part of your body, make an appointment with your health care provider to determine the cause of the white marks and seek a proper treatment regimen. Can You Get a Ringworm on the Mouth?